The Mizzou SAIFD Chapter sent four students to the 2015 AIFD Symposium. Pictured, left to right: senior Gina Olsen, freshman Taylor Strain, instructor Lesleighan Kraft, freshman Katie Stoops, senior Hanna Souther. Image courtesy of CAFNR News. The women representing MU at the AIFD symposium in Denver. Image courtesy of the @MUTigerGarden Twitter account. Kim Martin didn’t know what to expect when she started developing a floral design program for the University of Missouri College of Agriculture, Food and Natural Resources’ Division of Plant Sciences. She just knew that she wanted to provide her students a pathway to internships and jobs. That desire led her to the American Institute of Floral Designers. Martin and a student went to the AIFD Symposium in 2012 to drink in as much information as possible. They came back and started working right away on creating a chapter at the University of Missouri. 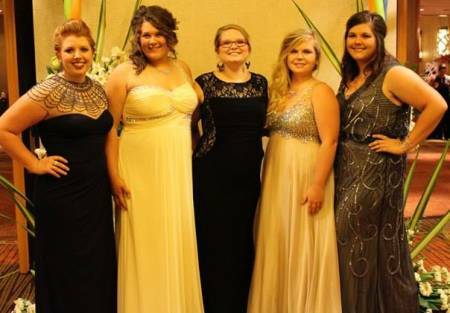 At the 2013 symposium, the Mizzou Student American Institute of Floral Designers Chapter became a reality. In just three short years, the Mizzou SAIFD Chapter has seen significant growth. The organization had only seven members when it first started and is now up to 15. That experience has led to recent accolades as well. The Mizzou SAIFD took four students to the 2015 AIFD Symposium, with all four earning top 10 finishes in at least one category during the competition portion of the event. They even had a first place finish – senior Hanna Souther in Arrangement Design. Those top finishes also led to a third place finish as a team. Not bad for an organization just three years young.